This was the Christmas present I received from my children. This made me so happy – the promise of a delicious sounding meal is the perfect present for me. I am particularly intrigued by the ‘salted caramel light bulb’ – the idea of my 6 year old son who has obviously been watching too many reality cooking competitions. Despite my last post (where I was very grumpy about Christmas) the festive spirit did eventually kick in and I actually ended up doing quite a bit of seasonal cooking. Mainly with my children as a way to keep them entertained during the holidays. You will most probably not be interested in reading about these recipes now that Christmas is well and truly over. But I am just making a note of them ready for next year – because the main user of this blog is me! Scroll down to see recipes for yule log, a gingerbread house and a chocolate salami (or just look at the photos). Or ignore and wait for my next post which will probably feature something healthy. I’ve been making this for a couple of years now but for some reason haven’t posted the recipe. The cake part comes from my trusty Peyton and Byrne British Baking cookbook. The icing is Nigella’s and it is the best chocolate icing I have ever tasted. I’m not a fan of yule log but it always goes down well with the chocolate lovers in my family and makes a good Christmas Day dessert alternative for those crazy people who don’t like Christmas pudding. Brush a 33cm x 23cm swiss roll tin (or shallow baking tin) with melted butter then line with baking parchment. Brush the parchment lightly all over with melted butter and then dust lightly with flour tipping out the excess. Beat together the egg yolks and 130g of sugar until pale and creamy. Sift together the flour and cocoa powder and fold into the egg/sugar mixture. In a separate, scrupulously clean, glass bowl whisk the egg whites with 35g of sugar and the pinch of cream of tartar until soft peaks form. Stir a third of the whites into the egg yolk mixture to slacken the mix, then gently fold in the remainder with a metal spoon taking care not to knock out too much air from the mix. Pour into the prepared tin and spread out as evenly as you can with a palette knife. Bake for 15 minutes until the cake has risen and is springy to the touch. Dust the top of the cake with icing sugar and place a layer of clingfilm on top followed by a chopping board. Tip the cake out onto the chopping board, then take the short end and roll up incorporating the clingfilm into the roll. Leave to cool completely all rolled up. For the icing, melt the chocolate in a microwave or in a heatproof bowl over a pan of simmering water. Let it cool a little. Mix together the soft butter and icing sugar until pale in colour. Then add the melted chocolate and the vanilla essence. Beat until smooth. Unroll the cake and spread with an even layer of icing. Then cover the outside of the log with icing and use a skewer to make log like marks. NOTE: For a less rich cake, make half the amount of icing and fill the centre of the roll with whipped cream saving the chocolate icing for just the outside. I once made a gingerbread house from a kit. It was fun to make but inedible. The gingerbread itself was vile – stale and tasteless. Do follow Mary’s advice about rolling between baking parchment it makes it much easier. Also remember to trim the gingerbread after cooking using the template as a guide as it will have spread a bit. I forgot to do this but it would have been easier if I had. I had a lot of gingerbread left over which I made into biscuits. The gingerbread itself is absolutely delicious. Next year I’m going off piste and designing my own template. Divide the mixture into five equally-sized pieces, cut one of these pieces in half (so you have six pieces in total). Roll each piece out between two sheets of baking parchment until it is about ¾cm thick. Using the templates as a guide cut out all the sections and slide onto baking trays before baking. For the pieces with windows remove from the oven after 7-8 minutes, sprinkle boiled sweets (crushed with a pestle and mortar) into the window holes and return to the oven for another 3-4 minutes until the sweets have melted. For the other pieces (without windows) bake for 10-12 minutes. You will need to do this in batches unless you have a very large oven and several baking trays. Remove from the oven and leave to cool for a few minutes, then trim around the templates again to give clean, sharp edges. Leave to cool completely on a wire rack. You will not be able to remove the windowed pieces from the baking parchment until the windows have cooled and hardened completely. For the icing, whisk the egg whites in a large bowl until frothy. Using a wooden spoon or a hand-held electric mixer on slow speed, add the icing sugar a tablespoonful at a time. Stir in the lemon juice and beat the icing until it is very stiff and white and stands up in peaks. On a cake board spread a layer of icing thinly over the surface to stick the house on to and to create a snow effect. Use the icing to glue all the pieces together and assemble the house. It is helpful to have another pair of hands but the mixture sticks and hardens very quickly so this part is not as tricky at it looks. Mary suggests using cocktail sticks to hold the roof in place but I didn’t find this necessary. I don’t believe in being prescriptive about the decoration. Buy lots of sweets and chocolate buttons and be creative. Use a little blob of icing to glue each sweet to the gingerbread and pipe icing around the edges of the house if you want a neat look. For younger children just smear the icing all over the surface and then let them add sweets in any way they like. Try to let go of any urge to be neat and tidy and buy extra sweets as for everyone that goes on the house another will go in the mouth. This is good fun – it’s basically a chocolate biscuit fridge cake doing a very good impression of a giant meat salami. It flummoxed everyone in my family. It keeps very well in the fridge so it can be made well in advance. My husband is still ploughing through ours and will not entertain the idea of throwing it out. Melt the chocolate either in a microwave (which is what I do) or in a heatproof bowl over a pan of simmering water. Set aside to cool a little. Smash up the biscuits in a polythene bag with a rolling pin. You want a rough texture not dust. In a mixing bowl cream together the butter and sugar and add the eggs one by one. Then mix in the liqueur. Don’t worry if the mixture looks curdled. Sift the cocoa powder into the melted chocolate and then stir the whole lot into the egg mixture. Finally add the crushed biscuits and nuts and mix thoroughly to make sure that everything is covered with chocolate. Put in the fridge for half an hour to firm up a bit. Now for the shaping. Lay a couple of sheets of cling film onto your work surface and tip the chocolate mixture into the middle. Shape the mixture into a rough sausage shape (approximately 30 cm long) and then roll up with cling film and twist the ends of the clingfilm to tighten. Then put it in the fridge for to set for at least 6 hours but overnight would be better. Dust your work surface with icing sugar. Take the salami out of the fridge and tie some string onto the twisted clingfilm of one end. Trim away as much cling film as you can but leave the two twisted ends. Dust the whole salami and your hands with icing sugar and then string up the salami – this is tricky to describe but this video is helpful. Finish by tying the twisted end with string. Roll up in tin foil or a new layer of clingfilm until you are ready to serve. I’m not cooking Christmas dinner this year, but if I was, this would be the starter. It has always been tradition in our family to have something fishy to start the Christmas meal (I was simply horrified when I had Christmas dinner at my in-law’s and they served up tinned beef consomme with packet croutons – we took over the cooking after that). 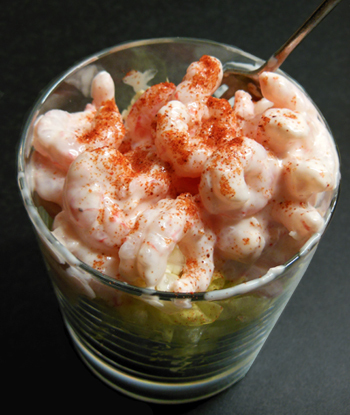 You may think prawn cocktail dull and old fashioned – at times I’ve thought the same – but I’ve tried alternatives and still come back to this because it’s just so damned delicious. And this Rick Stein recipe for the Marie Rose sauce is the best one I’ve found. The secret ingredient is brandy. I love prawns but my son is so obsessed with them that he even tried to persuade me to make prawn curry when his friend came for tea. “Mummy, J’s never had prawn curry and he really wants to try it”. Nice try Eddie – I went for Spaghetti Bolognese – but to appease him we made prawn cocktail for Saturday night’s tea and he enjoyed helping to make it (see photo below). PS. In case you’re interested here’s a recap of some of the Christmas recipes on this blog. I made my first batch of mince pies this week and am feeling quite Christmassy (I’m currently burning cinnamon scented candles and playing the Pogues). Mix up all the ingredients above and add some good quality prawns. 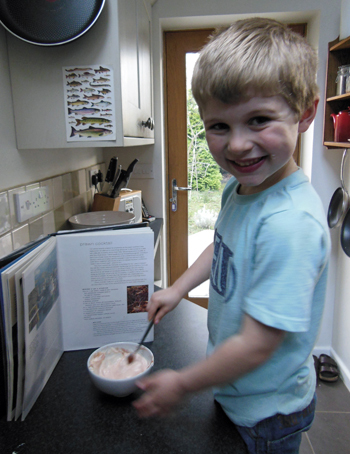 I like little ones the best as they tend to have more flavour than larger king prawns. Serve over thinly sliced ice berg lettuce and cucumber. Don’t forget the retro paprika sprinkling. I got told off by my husband this week when I attempted to play our special Christmas mix tape in the car. “Too early” he cries, “I’ll be sick of Christmas before it’s even here at this rate”. I sort of get his point, but this week it’s the school nativity and Christmas Fayre and so I’m forced to get in the Christmas mood whether I like it or not (for the sake of the kids of course). The good thing about this is that I have an excuse to finally try out my homemade mincemeat. I used a new recipe this year so I want to see how it tastes. I’m not great at traditional mince pies but I have these two recipes in my collection which make nice alternatives. The first uses ready-made filo and is a lighter option to shortcrust pastry. The second is a giant slab of a tart which you cut into squares once it has baked meaning that you don’t have to faff around with pastry cutters. It also has a buttery, crumbly topping which is just divine. It does seem a bit odd ball to make your own mincemeat and then buy ready-made pastry. Of course you can make your own pastry if you prefer. 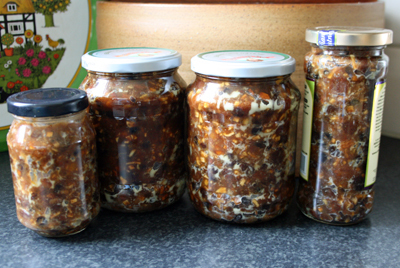 And if you think I’m a glutton for punishment making my own mincemeat then buy it in a jar – it works just fine. By the way, the homemade mincemeat was great – definitely the best recipe I’ve tried and not very onerous. Not surprisingly it came from good old Delia (yet again). I might blog it next year once I’ve given it another go. Preheat your oven to 180oC fan. Lay a square of filo pastry onto a dry work surface and brush with melted butter. Take another filo sheet and lay this on top. Spoon a thin line of mincemeat in a diagonal line across the square, then fold the filo sheet in two over the mincemeat to form a triangle. 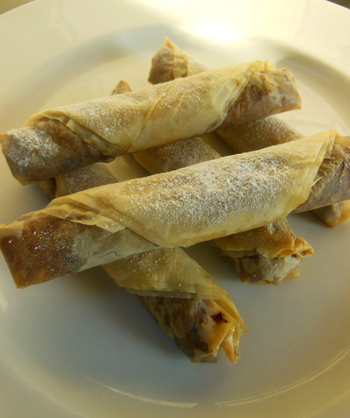 Fold over the two ends about ½ cm from the edge and then roll up into a cigar shape from the mincemeat end up. Place on a non-stick baking tray with the join at the bottom and continue the process until you have 12 cigars. Brush the cigars lightly with melted butter and then bake for 12-15 minutes until crisp and golden. You can make these ahead and store in an air tight container. You can then reheat them in the oven (at 180oC fan, as before) for about 5 minutes. Add all the ingredients for the topping together in a bowl and mix. Tip the mix onto a square of cling film and roll into a thick sausage shape. Chill in the fridge until solid. Preheat your oven to 190oC fan. Roll out the pastry to form a rectangle about 3mm thick. Transfer to a rectangular baking sheet and turn the edges of the pastry over slightly at the edges to create a rim. Spoon the mincemeat over the surface of the pastry and distribute evenly with a palette knife right to the edges. Take the topping out of the fridge and remove the cling film. Using a cheese grater grate the topping and then sprinkle over the mincemeat evenly. Work quickly here as the butter in the topping will start to melt and stick together when at room temperature. Bake for 20-25 minutes until the topping and the pastry are nice and golden. Remove from the oven, cut into rectangles and dust with icing sugar. If you are making this in advance, to reheat bake for 20 minutes at 150oC fan.